The latest adventure required special gear and protective clothing. They geared up, and off they went with the other paintball warriors for a day of fun. It was another father son memory for the books. *Thank you for all the prayers for Andrew. He has an appointment with a urologist on the 15th. Praying for some answers. Total bad mother moment. Thank goodness it was my only mothering mistake of 2011 : ) Seriously. We are praying for Andrew every day. Love you. Love Andrew. 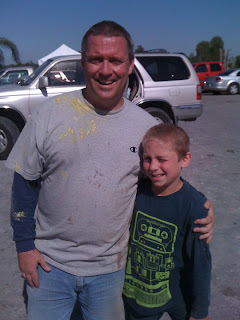 Love that we have a wise and sovereign savior who is holding Andrew in His hands. Oh Mikey loved that so much! I hope you all get good news on the 15th. Will be praying for that precious Andrew and all his loved ones! 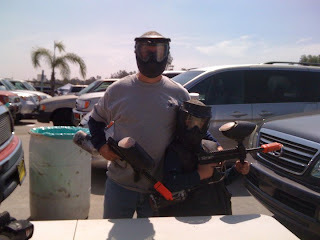 Looks like he and his dad have a great bond--now when are you going to play paintball, Grandma J? That's too extreme for me! I'm fragile. m.
I'm glad they had a fun time together. Prayers here that the doctor can find the answers needed for Andrew. We love lasertag around here but there is nothing like making memories. I will keep Andrew in my prayers GJ!